One of the first things on my vacation agenda (after coffee and shopping!) 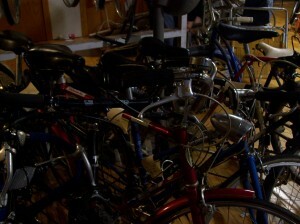 was visiting Milwaukee Bike Collective. From their website: The Milwaukee Bicycle Collective is an all volunteer, non–profit organization that provides a publicly accessible bicycle resource center for the city of Milwaukee. 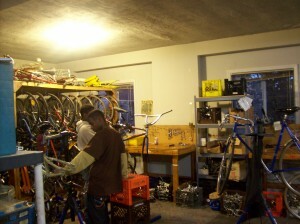 The Milwaukee Bicycle Collective is a place where bike repair and bike construction can happen in a creative and supportive atmosphere at an affordable cost. 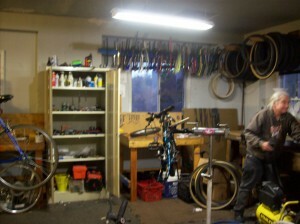 We fix bikes and help others learn how to fix their bikes. …We feel strongly about working to create a world where human–powered transportation is the norm and available to everyone. 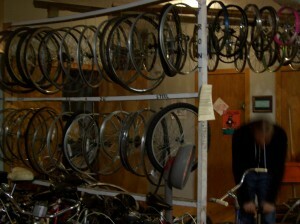 The Milwaukee Bicycle Collective has been working towards this goal since June 17, 2002. That is 7 years, a long time for a bike collective. I shot them an email and they were more than willing to meet me during open hours for a tour and chat. Upon entering the shop I could see it was something special. 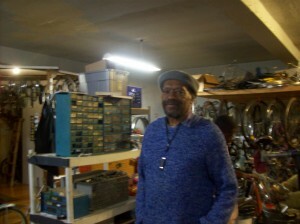 I was greeted by Pops, a friendly, caring, tough as nails gentleman who has been with the shop for 5 years. As soon as the shop opened, youth scrambled in and were given tasks by Pops and Jim, my tour guide. Within 2 minutes, a youth was asking for a new bike, saying his had been stolen. Pops was kind but firm, telling him that they are taught to lock their bikes and this particular boy could not get a new one that day. Anyone who runs a shop with a youth program knows what a challenge this situation is, so seeing it handled so well was refreshing and helpful to me. 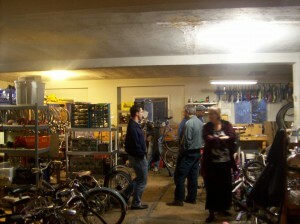 The shop was full of bikes and youth, but surprisingly well organized. 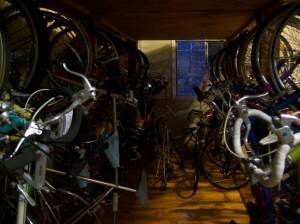 Bici aspires to be as organized! They have adult and youth programs and have planted themselves in the community well. It was encouraging to talk to Jim and hear about what they are doing, the challenges they face and how they have come to exist, successfully for 7 years. I left feeling hopeful and excited. If you are in Milwaukee, check them out. Make a donation (these shops aren’t free!) and support the good work they are doing. for more Milwaukee Bike Love, check out MKE Bike Spotting, done by a Milwaukee Bike Collective Volunteer, Matt, that I had the pleasure of meeting at a random bike shop in town! I really need to get over and check out the Milwaukee Bike Collective, I’ve still got a bike to donate! Thanks for visiting our shop! I hope you were able to take something away and apply it to your own Collective. I also hope to make it down to Birmingham sometime and hopefully I can take away just as much. Awesome! Just the day before I was writing about a similar bike shop in Memphis. Come visit Revolutions Community Bicycle Shop if you’re ever in town.